What is the first thing that comes to mind when I mention the words 'cake' and 'cheese'? Cheese that is melted on top of a cake? A cake made out of cheese? Or should I simply refer to it as a cheesecake? Recently, I have been invited to a wedding, and the first thing that comes to my mind is the bride and groom cutting their wedding cake. Now obviously weddings and cheesecakes have nothing to do with a power supply we are reviewing today -- but before you click the little 'X' next to your browser's tab, let me ask you this question first before moving on further in this review: Would you buy an ugly looking cheesecake to munch down on, or an ugly wedding cake for that special someone? Probably not, and I believe nine out of ten people would agree also. In the world of computers, PC enthusiasts will go pretty far in obtaining hardware to make their system look pretty, and I have to admit that I am one of them. Not too long ago, I was browsing the internet in search of some new hardware for my system, and it so happens that I have stumbled across a good looking power supply, in which I am going to report on today. 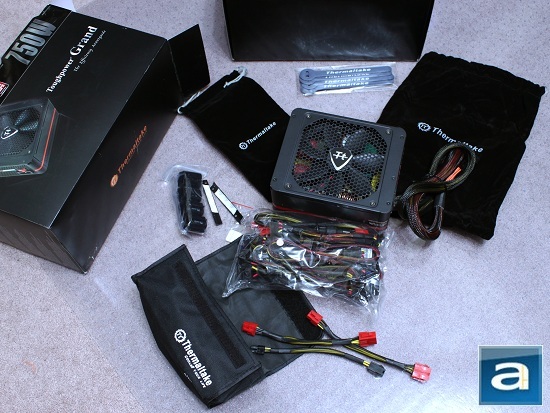 This is no other than the Thermaltake Toughpower Grand 750W. At first glance, it has a simple, yet unique strip of red on a dark matte body. As well, a Ferrari/Lamborghini inspired logo is stamped onto the honeycomb mesh in front of the fan. Without further thought, I told myself this was one power supply is a must-have for looks. But how well does its outer appearance reflect its internal quality? Being an 80 Plus Gold certified power supply, I am quite confident that Thermaltake has produced a quality cheesecake... I mean, a power supply. Keep reading to see what we have found! 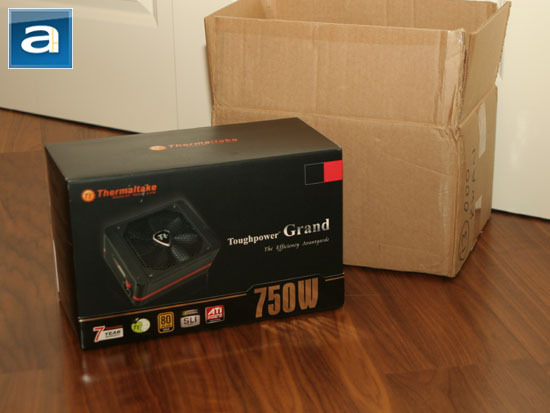 Our Thermaltake Toughpower Grand 750W power supply unit came in a brown corrugated medium sized cardboard box using USPS from Thermaltake's offices in California, USA, and has arrived at our Calgary, Alberta, Canada office in excellent condition. I have to admit that I was quite surprised the box was not overly damaged, since I have previously seen boxes that were pretty beat up. Not to worry, as we progress into this review, you will be satisfied to know the Toughpower Grand is in good shape. The Toughpower Grand's retail packaging is quite unique and mysterious in my opinion, as it features a prominent black background with red highlights. 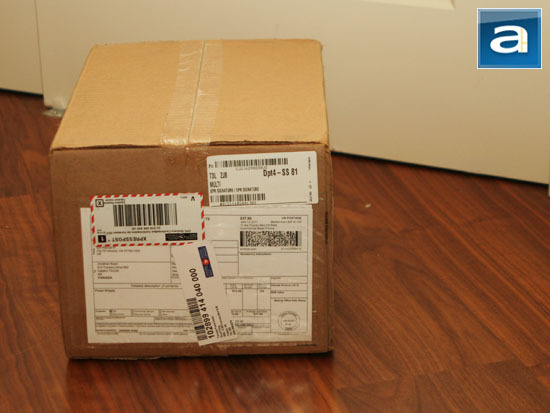 A photo of the power supply is shown distinctly on the left side of the box; with its model name printed boldly on the right using the slogan "The Efficiency Avantgarde". Thermaltake's logo and company name can be found on the upper left hand corner. Something special I have noticed about the retail packaging is that there is an additional strip of cardboard incorporated onto the front flap. On this strip, we can see the Toughpower Grand's 750W maximum wattage specification printed in silver, as shown in our photo above. To the left of it is an array of four icons; stating it is AMD CrossFire X Certified, NVIDIA SLI Ready, 80 Plus Gold certified, and Tt Eco-Friendly; plus a badge highlighting its seven year warranty. Opening up this flap gives you a more detailed description of its features. Flipping the box over to the back side provides you with a clearer picture of the connectors, as well as the specifications and features of the power supply. - 12Vin1: Toughpower Grand Series is equipped with a pure and powerful single +12V rail to provide the best compatibility for your PC. - Auto FanDelayCool: Auto FanDelayCool allows fan to continue to operate (around 15sec) after system shuts-down to ensure all components are properly cooled. - High quality & reliability: 100% 105c/221F Japanese electrolytic capacitors. Solid state capacitors in +3.3V & +5V. - Newly designed Double Forward circuitry: DC to DC Converter Design for +3.3V + +5V & synchronous rectification circuit for +12V. Double Forward & new Active PFC Circuit design. - NVIDIA SLI & AMD CrossFire X Certified: Toughpower Grand series is certified by NVIDIA & AMD most severe 2-way graphic cards test. - Ultra silent dual ball bearn flower-shape fan with honeycomb ventilation: Proprietary ultra silent dual ball bearing 14cm fan always operates at optimal speed (according to temperature inside the power supply unit) for the quietest performance. Besides, the innovative honeycomb grill provides the best ventilation. - Vibration Absorbent Gaskets: Through the use of special materials, the viration absorbent gaskets can be the optimal buffer against vibrating noises and are easy to install.